Make beautiful music with the Melissa and Doug Wooden Recorder! This easy-to-learn musical instrument is a favorite amongst parents and kids alike! Simply blow into the mouth piece and cover specific holes to create a song! 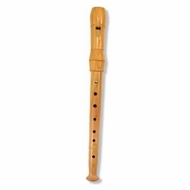 The Wooden Recorder offers a fun and interesting way to develop rhythm, melody, and fine motor skills.